BSP candidate Guddu Pandit threatens to thrash Congress' Raj Babbar, his aides with slippers: In an affidavit filed in 2013, Pandit had admitted that 13 criminal cases were pending against him. In 2018, a girl had filed a sexual harassment case against Pandit. Guddu Pandit alias Bhagwan Sharma is notorious for making controversial statements. 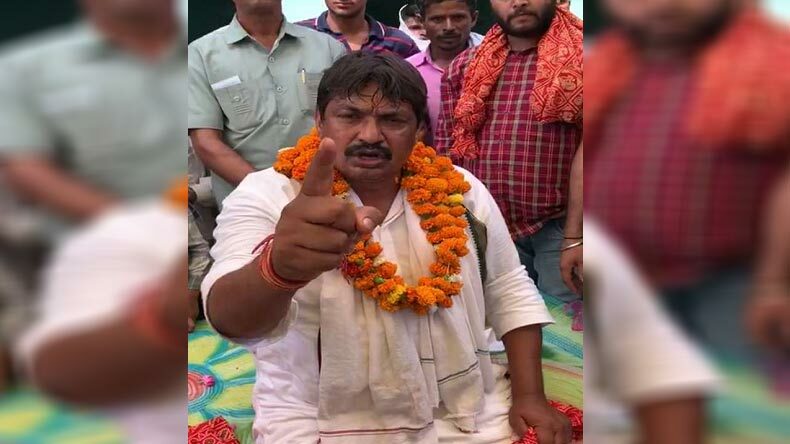 Bahujan Samaj Party (BSP) candidate Guddu Pandit alias Bhagwan Sharma, who is notorious for making controversial statements in the past, hurled abuses at Congress leader Raj Babbar and his supporters in Fatehpur Sikri on Monday. In a video, that has gone viral on social media, Pandit threatened to thrash Raj Babbar with slippers on the streets of Uttar Pradesh for spreading canards against the BSP. An infuriated Pandit also used unparliamentary languages against the Congress leader and vowed in the name of Ganga to beat him and his aides mercilessly. Pandit said: Sunn lo Raj Babbar ke kutton, tumko aur tumare neta nachaniya ko dauda dauda ke jooton se maarunga jo jhoott faelaya samaaj mein. Jahan milega, Ganga maa ki saugandh tujhe jooton se maarunga, tujhe aur tere dalaalon ko. The hate speech reared its ugly head on Monday when the Election Commission condemned Uttar Pradesh Chief Minister Yogi Adityanath and BSP supremo Mayawati for their communal remarks and placed a temporary ban on election campaigning by Adityanath and Mayawati for violating the model code of conduct. In an affidavit filed in 2013, Pandit had admitted that 13 criminal cases were pending against him. In 2018, a girl had filed a sexual harassment case against Pandit. After the case came to media glare, then chief minister Mayawati had called Pandit to her bungalow in New Delhi. Following the political meet, the Uttar Pradesh Police arrested Pandit. In 2012, SP chief Akhilesh Yadav had not only allotted Pandit party ticket despite his criminal track record, but also to his brother Mukesh Pandit. The Pandit brothers registered a thumping victory and strengthened the SP. In 2007, Guddu Pandit had contested from Debai Assembly constituency on a BSP ticket and won the election. Guddu Pandit defeated Bharatiya Janata Party leader Kalyan Singh’s son Rajbeer Singh ‘Raju’ in Debai which is known as their pocket borough. In 2012, Pandit registered his victory from the same seat again after he quit the BSP and contested on a Samajwadi Party ticket. Here, he defeated Raju for the second consecutive time. The BJP fielded Raj Kumar Chaher from Fatehpur Sikri Lok Sabha constituency but denied ticket to sitting MP Choudhary Babulal in 2019 Lok Sabha elections. Chaher will face Guddu Pandit of the BSP and Raj Babbar of the Congress. The Uttar Pradesh on Monday seized huge quantity of weapons and liquor during regular checking in the state’s Bulandshahr district. SSP N Kolanchi said the police teams seized 405 illegal weapons, 739 cartridges, liquor worth Rs 2 Crore and Rs 1.5 crore unaccounted cash. The checking will continue in Uttar Pradesh till further order, he added. Debai is a part of the Bulandshahar district and one of the 403 constituencies of the Uttar Pradesh Legislative Assembly.